The child slaves that make your electric car possible. And it’s feared that thousands more children could be about to be dragged into this hellish daily existence – after the historic pledge made by Britain and other countries and cart manufacturers to ban the sale of petrol and diesel cars and switch to electric vehicles. 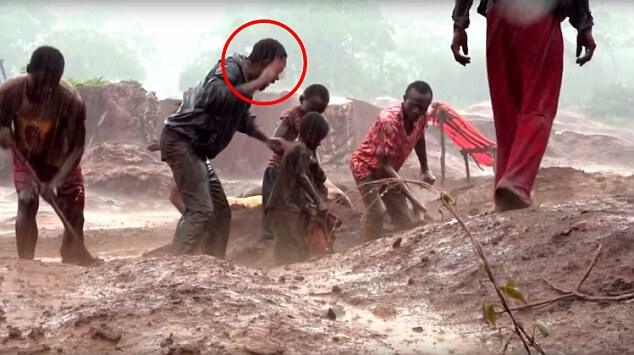 Young children are working at Congo mines in horrific conditions. A future of clean energy, free from pollution is proposed, but such ideals mean nothing for the children condemned to a life of hellish misery in the race to achieve this goal. He then staggers beneath the weight of a heavy sack that he must carry to unload 60ft away in pouring rain. Adult miners dig up to 600ft below the surface using basic tools, without protective clothing or modern machinery. Sometimes the children are sent down into the narrow makeshift chambers where there is constant danger of collapse. Dorsen and 11-year-old Richard are pictured. With his mother dead, Dorsen lives with his father in the bush and the two have to work daily in the cobalt mine to earn money for food. he worldwide rush to bring millions of electric vehicles on to our roads has handed a big advantage to those giant car-makers which saw this bonanza coming and invested in developing battery-powered vehicles, among them General Motors, Renault-Nissan, Tesla, BMW and Fiat-Chrysler. 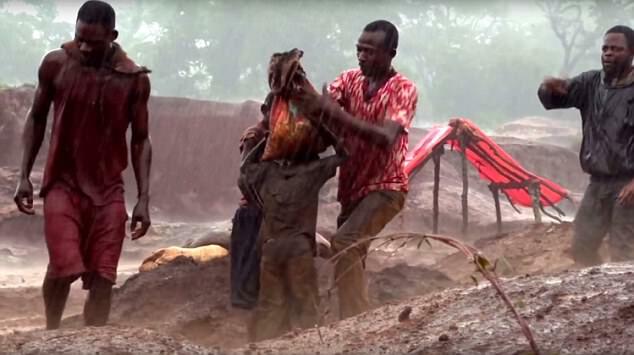 Chinese middle-men working for the Congo Dongfang Mining Company have the stranglehold in DRC, buying the raw cobalt brought to them in sacks carried on bicycles and dilapidated old cars daily from the Katanga mines. They sit in shacks on a dusty road near the Zambian border, offering measly sums scrawled on blackboards outside – £40 for a ton of cobalt-rich rocks – that will be sent by cargo ship to minerals giant Zhejiang Huayou Cobalt in China and sold on to a complex supply chain feeding giant multinationals. After DRC, Australia is the next biggest source of cobalt, with reserves of 1 million tons, followed by Cuba, China, Russia, Zambia and Zimbabwe. Car maker Tesla – the market leader in electric vehicles – plans to produce 500,000 cars per year starting in 2018, and will need 7,800 tons of cobalt to achieve this. Sales are expected to hit 4.4 million by 2021. It means the price of cobalt will soar as the world gears itself up for the electric car revolution, and there is evidence some corporations are cancelling their contracts with regulated mines using industrial technology, and turning increasingly to the cheaper mines using human labour. 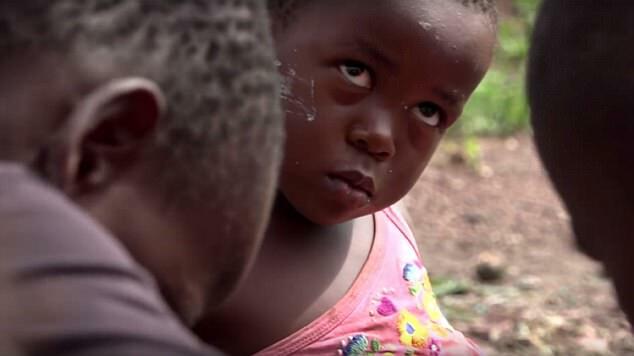 After the terrible plight of Dorsen and Richard was broadcast in a report on Sky News, an emotive response from viewers funded a rescue by children’s charity Kimbilio. They are now living in a church-supported children’s home, sleeping on mattresses for the first time in their lives and going to school. 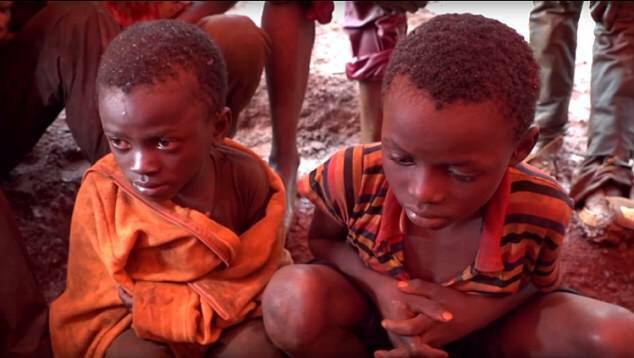 But there is no such happy ending for the tens of thousands of children left in the hell on earth that is the cobalt mines of the Congo. So, in order to prevent their death from climate change, we kill them in the mines instead. They are caught in a life-and-death Catch-22, and we are caught in the moral one There is so much wrong with this I can hardly even start, but I’ll try. Dorsen’s mother is dead. What do you want to bet she died in childbirth? What do you want to bet that the mortality rate is high for new mothers there partly because “conservatives” in the United States have tied a string to all foreign aid that none of it can be used for abortion, which, in practice, means none will get used for women’s health care? Had his mother not died, would he have to work in the mines? Would SHE have to work in the mines? Where does it end? Your question is definitely more constructive than mine. Woman “Live Streams” her own death in car crash.